Walking on the moon has a nice ring to it: it’s kind of astronaut-ish. Well, I did walk on the moon and I’m not even close to being an astronaut. 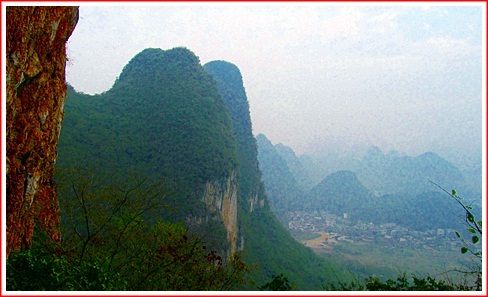 Of course, I am referring to Moon Hill which is located in Yangshuo, Guangxi Province in China. 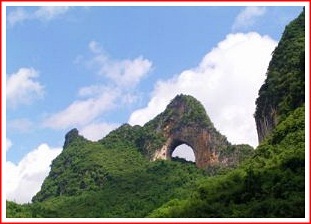 To the right is a picture of the place as you might find it on a purchased postcard. All the rest of the pictures are my own photos. And speaking of postcards, when we arrived at the entrance – kind of a parking lot, my guide, Rong, quickly handled the admission process – I think it was 15 RMB. She never asked me for it as it must have been included in her guide fee for the day. Immediately, we were set upon by three elderly ladies – all of which were hawking postcards, and assorted drinks. I had been warned about this by a couple I had met at the hotel. He said it won’t matter how many times you refuse, because you will eventually need to buy some water, if you haven’t brought your own, or if you don’t want to carry it up with you, you will be more than happy to buy some water from her. I was warned that none of the old women will take ‘no’ for an answer, and one will literally join your walking group and go up the hill with you. Sure enough, that’s exactly what happened, so instead of just me and Rong, the guide, we became a three-some. The lady carried a cooler that she held by a strap over her shoulder. There were about 4 bottles of water, and 4 cans of coke, and juice. She also carried some small oranges – real small, juicy and seedless as I would find out later. The guide had her own fanny back, and I later found out that she too carried some small oranges. 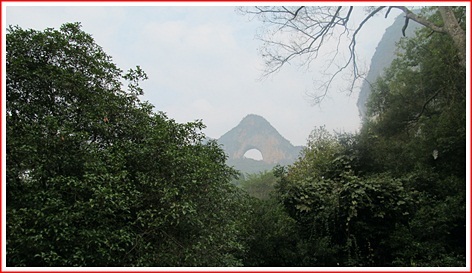 Well the journey consists of about 800 steps to the top of the hike which ends beneath the arch. The steps wend their way through the bamboo forests. Obviously it is not a straight route. Instead think of a set of folded sneaker laces before you take them out of the wrapper. Periodically, you arrive at small landings, where there would be stone benches. Along the way, the older woman spotted a length of bamboo, which she broke off the ends and handed it to me. It worked marvelously providing both additional support to push off of on the way up and for balance on the way down. If Moses could carry a staff, why couldn’t I. That's Yangshuo town far below as we take in the view from the "Moon"
We made it to the plateau beneath the arch in about 40 minutes. Younger and fitter people can make it in about 20-25 minutes. And yes, I did need to buy some water. I bought the first one about ¾ of the way up, the second at the top, and the third about half way down. It was a hot day with temps in the low 80’s. The lady with the water allowed me to do a running tab as we walked – I only paid her at the end of the trip once we were back at the parking lot. Yes, I also bought the packet of post cards too. I thought it was a fun way to get some exercise. The view from the top would have been spectacular if the day had been clear, but it was hazy throughout. The steps are fairly broad and wide, and you are never walking in anyplace that might be considered perilous on the way up or down. But it still requires plenty of effort and energy on the way up, and as you travel downward you absolutely must keep your eyes down so you can focus on each step. 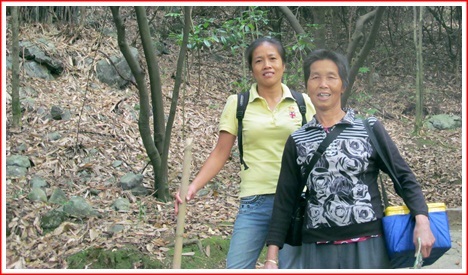 In fact the staff became extremely useful on our downward journey. Tip: Make this your first destination of the day. We left the hotel at 9:00 AM, and by 9:15 we were just about ready to start the hike. You don’t want to do this once the day really begins to heat up. 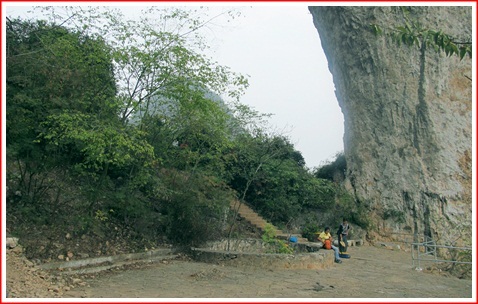 This entry was posted in Travel and tagged Moon Hill, Yangshuo. Bookmark the permalink. since I was here last!